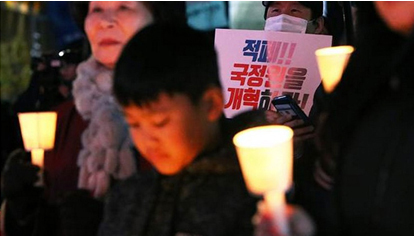 A candlelight rally was held at the Gwanghwamun Plaza in Seoul to mark the 2nd anniversary of candlelight resistance. Standing chairman Park Seok-woon of the Solidarity for Progress said that many changes witnessed by the victory of candlelight resistance and the Korean Peninsula, once a tinder-box, is advancing toward the trend of peace and prosperity. Co-representative Park Rae-goon noted that still many accidents are occurring after sinking of ferry Sewol and a stable society free from disaster and people-oriented society should be built. Genuine peace is ensured when people’s daily life change, we would launch a general strike in November to accelerate reform, chairman of the Korean Confederation of Trade Unions Kim Myong-hwan noted. They would demand the abolition of part-time job through the general strike, he said. When the candles were blown out by the wind, they raised high the pickets. In the middle of the rally, they appreciated a documentary film on 17 million-strong candlelight resistance held in 2016. At the end of the rally, they carried placards written “Take Yang Soong-tae into custody”.